Tissue/ cell preparation (Escherichia coli, all serotypes). 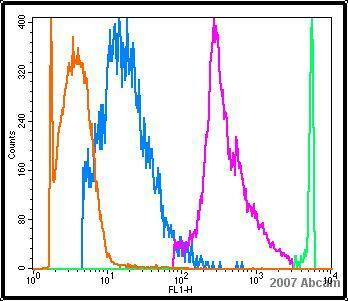 A mixed culture of E. coli strains (O157:H7, O20, O125, O55, O111 & K12), intact plus lysed, non-denatured, was gamma-inactivated and used directly as the immunogen. Our Abpromise guarantee covers the use of ab30522 in the following tested applications. ICC/IF 1/25. Acetone fixation of the antigen is recommended. Publishing research using ab30522? Please let us know so that we can cite the reference in this datasheet. Our customer is going to purchase ab30522. She will test this antibody on gold surface chip which is bounded protein A. She needs to detect using FITC so choose ab30522 but concerns if binding site of protein A and FITC conjugated site are overlapped. If you have information, please let me know. It might be possible for a FITC-conjugated IgG to still be able to bind to Protein A as well, primarily due to the fact that FITC conjugation to IgG and Protein A binding to IgG occur at different sites within the IgG molecule and utilize different modes of attachment. FITC binds to IgG via primary amines which are distributed in both the Fab and Fc regions. On the other hand, Protein A binding to IgG is confined to the Fc region; this non-covalent interaction involves the participation of carbohydrate (oligosaccharides) moieties attached to particular amino acids (e.g Asn) in the Fc region and the amino acid residues of Protein A. Based on these considerations, it ispossible for IgG-FITC to still be conjugated to Protein A. However, there is also the bulk of the molecules to consider. Wedo not have an exact ratio of FITC to IgG (typical ratio will be 3 to 10) and we do not know exactly which lysine residues are conjugated, or more importantly, how many of the ˜15 lysine residues in the Fc region of rabbit IgG are conjugated to FITC, which can possibly contribute some steiric hindrance effects and affect binding of the Protein A to the Fc region. One Protein A molecule is typically able to bind two or more unconjugated IgG molecules; bulkier IgG may reduce this binding. I hope this information will be helpful. 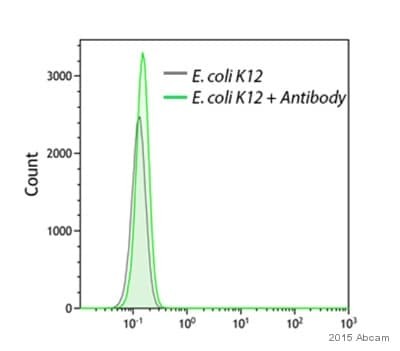 Please note that the E. coli antibody (FITC) antibody has regrettably not been tested and guaranteed for this particular application that the customer would like to use. Thank you for your patience. I can now confirm that ab30522 also cross-reacts with the DH5a strain of E.coli. I hope this information is helpful for your customer. Thank you for your patience. Regarding ab30522 (E.coli antibody (FITC)), a mixed culture of E. coli strains was gamma-inactivated and used directly as the immunogen. Although the concentration has not been determined, there is a dilution recommendation (IF: 1/25. Acetone fixation of the antigen is recommended). I hope this information helps. Please don't hesitate to contact us again if you have further questions.